When Douglas Young walked into the career counseling office at Wounded Warrior Project® (WWP) headquarters in Jacksonville, Florida, he had already accomplished so much. He is a decorated veteran with 24 years of service in the United States Air Force. He has several professional and educational accolades to his credit and a beautiful wife and children. In 2015, he had just relocated after retiring, and he was searching for something to do that didn’t involve golf clubs, fishing poles, or honey-do lists. He wanted guidance on how to turn his military career into a valuable civilian job opportunity, and specifically, how to present a resume reflecting a lifetime of military achievement and relevance to today’s workforce. Douglas was an impressionable young man from Belton, South Carolina. From an early age, he knew he wanted to be the type of person who helped others and gave back to his community. This desire was further fostered by his experiences in service organizations such as Boy Scouts of America. Growing up, he spent summers with his four uncles – all veterans from the Vietnam War. They had served in the Air Force, Navy, and Army – and Douglas immediately saw common threads among them despite serving in different armed forces and varying capacities. Honor, service, and valor were among those common threads. These early lessons and memorable experiences led Douglas to join the Air Force Junior Reserve Officer Training Corps (JROTC) program during high school with the goal of earning a college degree and becoming the first commissioned officer in his family. With this goal in sight, Douglas received several ROTC scholarships and an academy appointment. In 1980, he ultimately chose a Navy ROTC scholarship to the University of South Carolina. Douglas completed his degree and attended law school for one year before reevaluating his life path. He switched to a management training program in banking and, though he loved his banking career, he felt a reconnection with his goal of serving in the military. To do both, he thought of joining the reserves but learned that earning a commissioned officer spot would require enlisting as active duty. This time around, Doug chose the Air Force with plans to enlist for four years and return to continue his banking career as a branch manager. But he was simply having too much fun with his military role, which turned into an impressive 24-year military career. “Funny how things work out,” Douglas said. During his military career, Douglas held several high-level positions that placed him in charge of multi-million-dollar projects and managing hundreds, if not thousands, of military personnel. Serving as Director, Support Directorate at the U.S. Embassy in Kuwait was one of Douglas’ favorite roles during his military career. During this time, his entire military training (Defense Intelligence Agency and Air Force Special Operations) and university training (international relations and economics) intersected into an opportunity of a lifetime. The assignment represented the U.S. Embassy in Kuwait in the Office of Military Cooperation. Douglas was responsible for operations and logistics from human resources, information technology, and training programs to support military staff and family members with housing and security. Nearly all operations involving military personnel were under Douglas’ purview. At the pinnacle of this assignment, Douglas was elected President of the International Cooperative Administrative Support Services system – a country-wide coordination of multiple government-related agencies. A year later, Doug had moved on from his position in Kuwait and relocated back to Denver where he served as the Director, Reserve of the Air Force Promotion Board Secretariat. On a seemingly normal Colorado evening with the family sitting at the dinner table during ‘make your own taco’ night, Douglas floated the idea of retiring from the military. Family had always been a driving force in his life, and he valued the opinions of his wife and two children. It was a difficult decision – one that didn’t come lightly but came with a sense of peace and resolve that he had reached the pinnacle of this stage in his life. “My last two roles in my military career were things I had always dreamed of doing, and that gave me the ability to walk away knowing that I accomplished everything I wanted to accomplish within the military,” he added. At the time, Douglas’ family was also entering a very transitional phase of life. His oldest daughter had been accepted to Florida State University in Tallahassee, Florida, and his in-laws were in declining health. These circumstances, along with a strong sense of professional accomplishment, encouraged Douglas to move forward into the next phase of his life, and out of the military that had been such a huge part of his life since he was that young man from South Carolina. Douglas’ confidence was solid. He had held high-level positions in the military. In previous roles, it was common for him to sit in two-person meetings with executive personnel such as the Secretary of the Air Force to discuss policy, law, and in-country consultation on a spectrum of operational topics. His peers regarded him as a subject matter expert of operations and international relations, which allowed him great influence on topics of law, advocacy, and diplomacy. Douglas found out quickly that even though he held high profile positions, transitioning into a civil service job was not a guarantee. After applying for several open positions, he found more doors closing than opening, and that his move to Florida had disconnected him with the relationships needed to secure the type of job he had imagined. But Douglas was not deterred. Douglas explained that military training equips a person with a mindset that is crucial to helping transition from one role to another, one location to another, or in this case, one career to another. Arriving in Jacksonville, Douglas persevered and landed a civil service job. Taking his wife’s advice required some work and a reinvention that Douglas knew he needed assistance with. This was when he discovered WWP and its career counseling services. Douglas' VA representative introduced him to WWP. He registered and immediately attended a resume writing workshop and networking event in Jacksonville. WWP offers a full suite of career counseling services to empower wounded veterans to achieve their highest professional ambitions. This includes resume writing workshops, interviewing tips and techniques, and networking events with local companies looking to fill positions or offer specialized training in long-term career tracks. Douglas has been a passionate admirer of BMW cars since 1986 and feels that this automobile is the ultimate driving machine. It’s a love affair he said has been ongoing for more than 30 years. 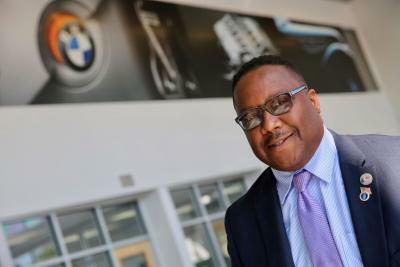 While preparing his new resume and thinking about next steps, Douglas’ wife kept driving home the point that he should do something he loved and suggested working at BMW. Upon reflection of his professional life, Douglas admitted he had never sold anything but ideas, so selling BMWs was something he had never even considered. However, of the many differences in his professional careers, Douglas shared that there has been at least one constant philosophy – do your best to move forward and connect with and serve people. Douglas employed that philosophy from day one and has never looked back. “Everything that made you successful in the military will carry forward when you put your mind to it. When you find your new mission in life, seek assistance from organizations like Wounded Warrior Project. They are excellent at what they do and can assist in ways you didn’t think of. They are able to highlight your strengths, help you realize potential, and in many cases can introduce you to potential employers or help you make the right connections toward your goals,” Douglas said. Douglas continues to regularly check in with WWP’s career counseling staff and is looking forward to meeting and interacting with other wounded veterans during future WWP programs. He hopes that, one day, he too can lend a helping hand to a fellow wounded veteran in the same meaningful way he was helped. Wounded Warrior Project is transforming the way America’s injured veterans are empowered, employed, and engaged in our communities. Learn more: https://www.woundedwarriorproject.org/programs/warriors-to-work.